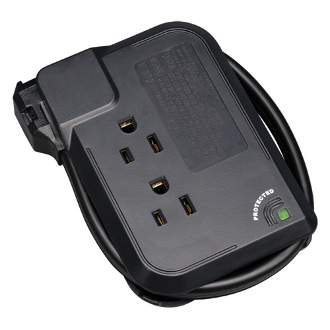 Tripp Lite's portable TRAVELER3USB surge suppressor offers complete surge suppression for laptops, electronic notepads, personal organizers and other portable electronic devices. Compact and portable, it neatly fits into laptop travel cases. Comes with an 18 inch concealable cord allowing for ease of storage without scratching expensive electronics. With the addition of 2 USB Charging Ports, the TRAVELER3USB allows Road Warriors the ability to charge cell phone, MP3 Players and other portable devices more easily. Copyright © 2013-2019 Newberry Electric Cooperative Surge Store. All rights reserved.